Have you ever read a Jane Austen novel and thought to yourself, "huh, this could use a daring high stakes heist scene or something"? If so, have I got news for you! Mary Robinette Kowal is one of my favorite authors and I always look forward to her Glamourist Histories books. They're perfect Regency novels with an infusion of deftly written magic. Each one is slightly different but equally magnificent. This time, Kowal has mixed a little Oceans 11 in with her Regency world and she pulled it off with aplomb! Jane and Vincent are two of my favorite characters in fiction right now (and who, along with Nick and Nora Charles, Frank and Sadie Doyle and Gomez and Morticia Addams have given me a completely unrealistic view of romance). Their adventures are always beautifully written romps through stunning locales. They've dealt with everything from uprisings to espionage. There's nothing Jane and Vincent can't do. That's why their latest adventure, Valour and Vanity, is such a treasure. It shows the hardest challenge the couple has faced yet and it was absolutely thrilling! To catch you up to speed, Jane and Vincent are glamourists. They creature beautiful works of art out of glamour, a magical ether in this version of the Regency. In the last volume, they figured out a way to blend glamour with glass spheres and trap it there. It's a huge break through! They decide to travel to Murano, which is famous for it's glass, to experiment more with the technique. Their trip to Italy is severely derailed when their ship is attacked by pirates. Left penniless in Venice, they rely on the hospitality of a gentleman they met on the ship and things begin to spin wildly out of control. Every Glamourist novel is painstakingly researched by Kowal. There isn't one word in that novel that wasn't used during the Regency. The clothing is period perfect. Honestly, part of me is convinced that Kowal is a secret time traveler. The absolute care she takes in getting everything right for the time period in her novels is laudable. That's what makes the fact that this volume turns into a heist novel all the more exciting. A Regency Oceans 11! It's genius. Jane and Vincent have to stake out a location, don devious disguises and crack into a well guarded safe. All the have are their wits, their glamour and the help of an eager puppeteer and a flock of helpful nuns. Valour and Vanity flew by. I was so sad when I reached the end. I hadn't noticed the swift passing of the page numbers at all. It was fast paced and well plotted. The side characters almost became as exciting as Jane and Vincent as well! How can you go wrong with Lord Byron being a drunk snark? It was wonderful! There was also Kowal's usual Doctor Who cameo which was the best of the lot thus far! The story explores a lot about the nature of marriage as well as the nature of magic. Jane and Vincent find themselves in some dire straits and almost come to the breaking point. There's a scene in the middle of the book about a bar of soap that is just horrifically tragic. Thankfully, they are able to rely on each other and find a way to save not only their research and their money but also their marriage. The heist itself was insanely well planned and full of enough surprises to make your head spin. It was just incredible. 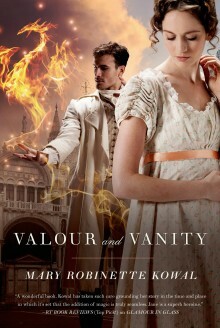 Valour and Vanity was another amazing novel from an amazing author. Mary Robinette Kowal is a master wordsmith and it is always a pleasure to sink into the world of regency magic she's created. There's one more book planned for this series and while I'm besides myself that it's so close to being over, I'm ravenous to find out what happens next! If you haven't read this series, you are missing out on one of the most unique and beautiful series to be released in recent memory. Find yourself a copy of the first volume, Shades of Milk and Honey, and get ready to get your bonnet knocked clear off. Jane Austen eat your heart out! This sounds like so much fun! I had a hard time with the third book in the series and so have lost a bit of my momentum. Not that it wasn't awesome, it was just so emotionally intense that it overwhelmed my reserves for that week. I'm really hopeful I won't be in the same place for this one!